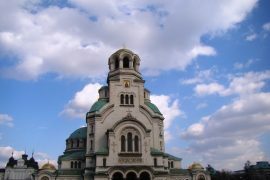 The Mediterranean region is one of the best places to visit for your summer vacation. 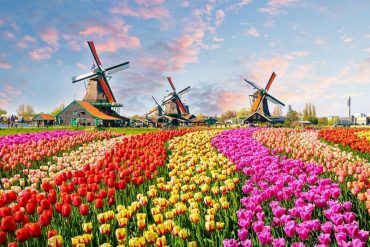 It has a variety of resorts to choose from, great food, plenty of sunshine and the most beautiful beaches to relax. 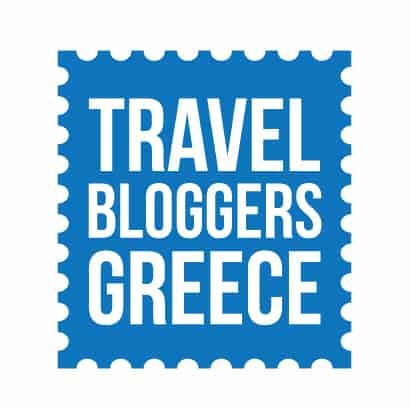 Here are some of the most stunning Mediterranean beaches recommended by travel bloggers. 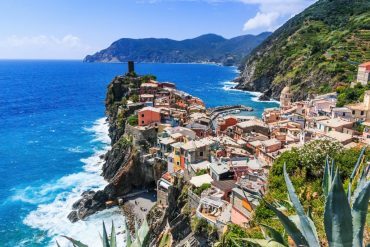 The best beaches in the Mediterranean Sea. Costa Rei, on the south east coast of Sardinia, is one of the best beaches in the Mediterranean, and has also been named as one of the best beaches in the world by Lonely Planet. Imagine a long, white, fine sand beach, occasionally interrupted by nice rock formations which offer views of the coast. The water is as clear as one can possibly imagine, and it gets gradually deep. Access is easy, so even families with children can enjoy it. The beach is fully serviced, with plenty of small kiosks to have a light lunch, a sunset drink or coffee. It’s a fantastic place to relax, to soak in the sun, and to spend a day with friends. If you’re planning a trip to see all of the Mediterranean’s best beaches Cala Soraja on the island of Spargi, in the Archipelago della Maddalena in Sardinia, Italy has to feature on your bucket list. 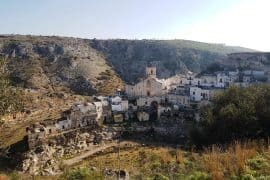 Cala Soraja is on a small island and is only reachable by boat, this helps thin down the crowds and makes Cala Soraja a hidden gem that not many people visit. 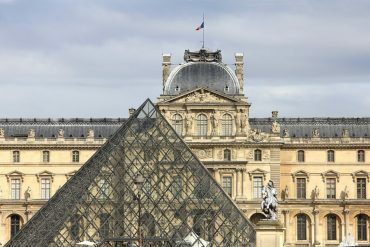 The best time to visit is early in the morning, before the day tour boat excursions have a chance to get there, or at sunset once the day tours are over. 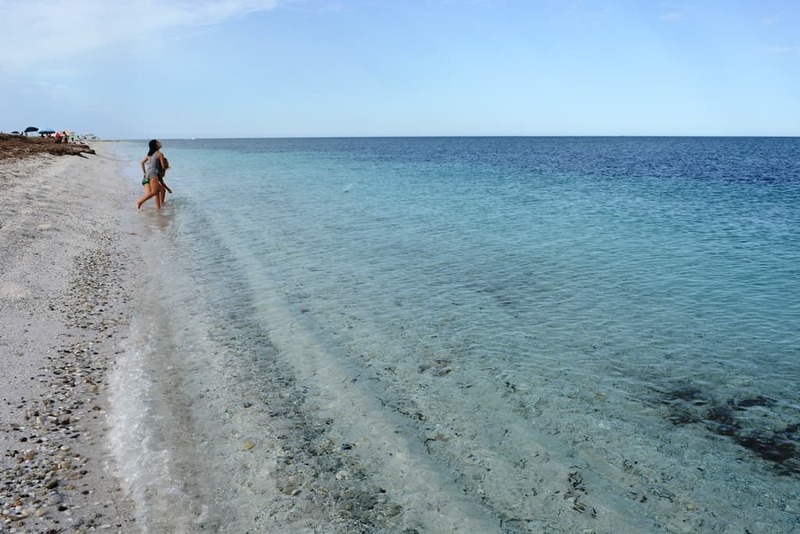 The beach is quite small and there are no facilities since the Archipelago della Maddalena is a protected natural park. So if you’re planning to stay there all day, make sure to bring plenty of water, food and sunscreen with you (and a beach umbrella if you think you’ll need some shade)! With its white sand beach and incredibly clear turquoise water Cala Soraja is truly a beach paradise. 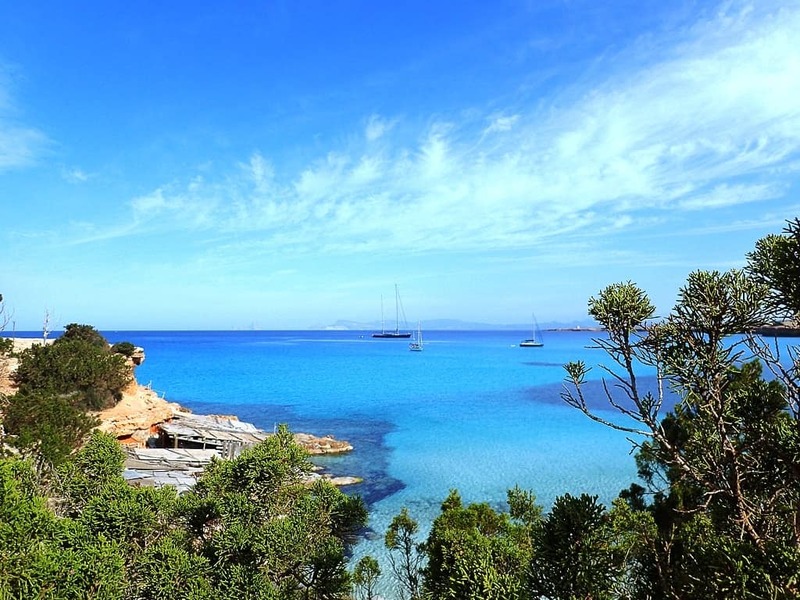 Find out more about visiting Cala Soraja and the other beaches in the Archipelago della Maddalena here. Tel Aviv is notorious for its beaches and rightfully so. It helps that Tel Aviv’s winter barely gets below 50 degrees F so it’s almost always beach weather. Tel Aviv stretches along the coast and boasts 6+ different beaches for any type of beach goer which is what makes it so unique. There is a beach for locals, a beach tourists flock to, a beach surfers aggregate at, a dog beach where dogs can roam without leashes, a beach for conservative women and more. Of course these aren’t strict and you can go anywhere, but it really makes for different angles on any part of the coast for anything you are looking for. Since the coast is also on the East, you are rewarded with stunning sunsets over the Mediterranean every single night. On Saturdays, Israels day of rest, many restaurants and stores are closed so locals and tourists alike all head to the beach when it is the most crowded as all you can do is relax. 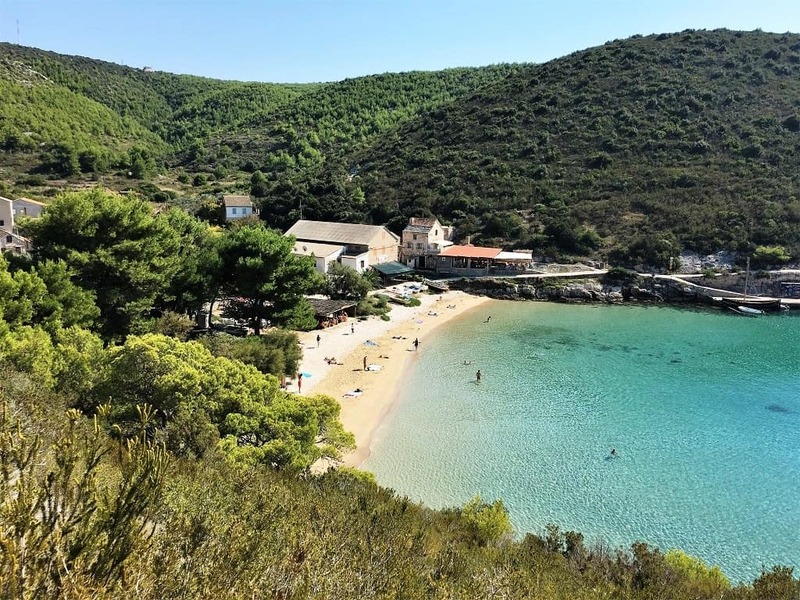 Lucice Bay can be found on the island Brač. Bračis the largest island in Dalmatia, a beautiful part of Croatia. Lucice Bay is a unique beach in the southwest of the island. The beach is very secluded, you can reach it via a small road from Milna. However, the best way to visit the bay with a sailing yacht! After anchoring your boat hop in your dingy to visit the beautiful crescent shaped beach. Don’t forget to climb up the hill for a great view over the bay. There is even a small restaurant on the beach so no need to leave anytime soon. We’ve been traveling in South East Asia for almost one year, and while we surely saw some stunning beaches, none of them can be compared to this one we didn’t know we had on our own backyard. Is Arutas beach is made of quartz pebbles, tiny, colorful and soft, resembling rice grains, but of the most colorful nature. White, golden, pink, glittering in the sunlight, soft when touching your skin. The water is transparent, deep blue and refreshing cold. Going off-season (which here it means not in August), it’s even possible to be almost alone here. Arutas is located in the Sinis Peninsula, one of the most beautiful areas of Sardinia, located in Oristano province, near the town of Cabras. Just a few km from Is Arutas is the ancient Phoenician-Greek-Roman city of Tharros, that shouldn’t be missed. 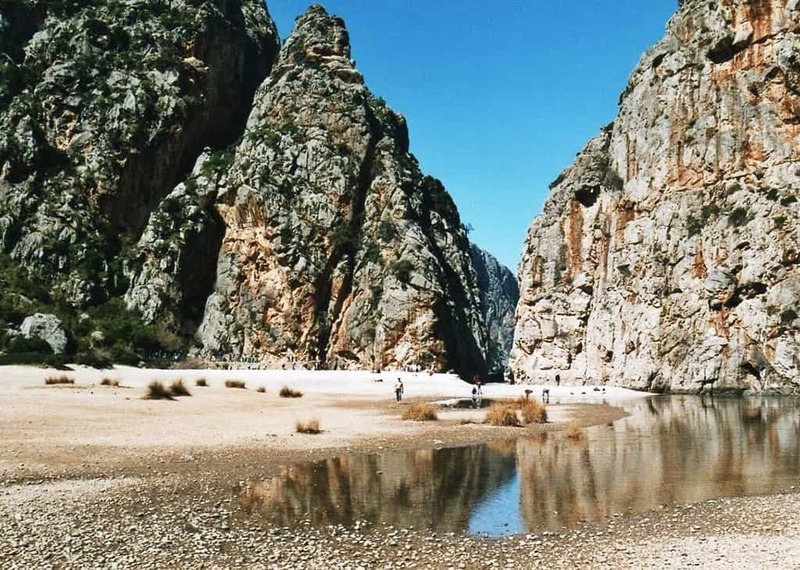 Learn more about it by reading our two-weeks perfect itinerary in Sardinia. There’s only so much you can do in Malta without hitting a beach! The summer’s heat and humidity will, no doubt, push you to seek refuge in the crystal clear waters. But leave the sandy beaches to the tourists. The rocky St. Peter’s pool on the south side of the island is one of the best beaches in the Mediterranean for thrill seekers. The pool gets busy with the locals in the summer, but it’s perfect spot for a quick dip. The white chalk rocks here look especially stunning against the crayon blue sea. This natural swimming pool is great for adventurous souls as the rocky cliffs formed by nature provide safe cliff jumping conditions. The rocks are not too high, but thrilling enough to jump into the deep blue waters of the Mediterranean sea. If you are not too keen on cliff jumping, shallower pools are also available further away from the main rocky beach. Click here for more things to do in Gozo, Malta. 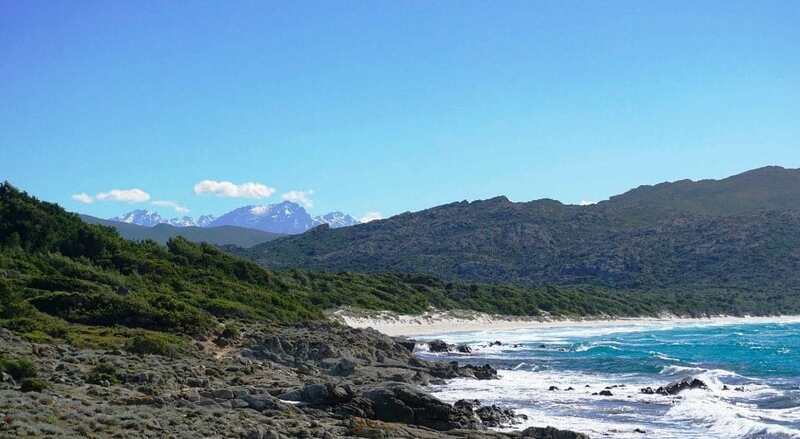 Saleccia beach is hidden in a remote corner of northern Corsica. To reach it you must walk for several hours (or days if you take the coastal route) through a rugged desert landscape, take a 4WD down a precarious dirt track, or catch a taxi boat from nearby Saint-Florent. It’s worth the effort though. When you arrive, you’ll be greeted by one of the most beautiful beaches you’ve ever seen. The fragrant Maquis shrubland gives way to a vast expanse of pure white sand, and the calm turquoise waters of the Mediterranean lap gently at its heels. Despite its remoteness, it’s still a popular spot in the summer months. But visit outside of the peak season and you’re likely to have the beach entirely to yourselves – minus the odd chestnut coloured cow napping nearby in the sun. Jaz Beach in Montenegro, close to Budva, is one of the most beautiful beaches in the Mediterranean. The water is brilliantly turquoise, and the water in this part of the Mediterranean are warmer and saltier than other parts, making it even lovelier to swim in. Jaz Beach is especially beautiful for its striking sheer cliffs on nearby Tivat road, where you can get an excellent view of the entire beach. 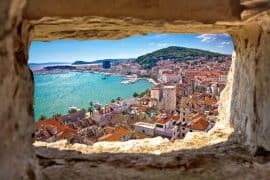 The beach is quite long, but in peak summer season it can still get crowded as everyone from Montenegro – and a handful of tourists – descend on one of the country’s best beaches. If you’re into music festivals, you’ll want to come during July’s Sea Dance Festival, with over a hundred thousand music fans! The best time of year to visit Montenegro’s beaches are on the shoulder seasons – namely May and September – when the beaches are slightly less crowded but just as beautiful. The most beautiful beach I have seen on the Mediterranean is that of Mojácar Playa on the Costa del Almeria. Perfect golden sand with long stretches that are practically free of sun worshipers. The beach here runs for 17km down the coast and is relatively unknown to most tourists (outside of the Spanish). Mojácar Playa is in eastern Andalusia and sits shaded by the Sierra Cabrera mountains. The playa gets its name from the beautiful hillside pueblo of Mojacer that sits above the beach. There are plenty of chirinquitos to grab a Tinto Verano at, and a great selection of restaurants and beach bars to hang out at and watch the sunset. 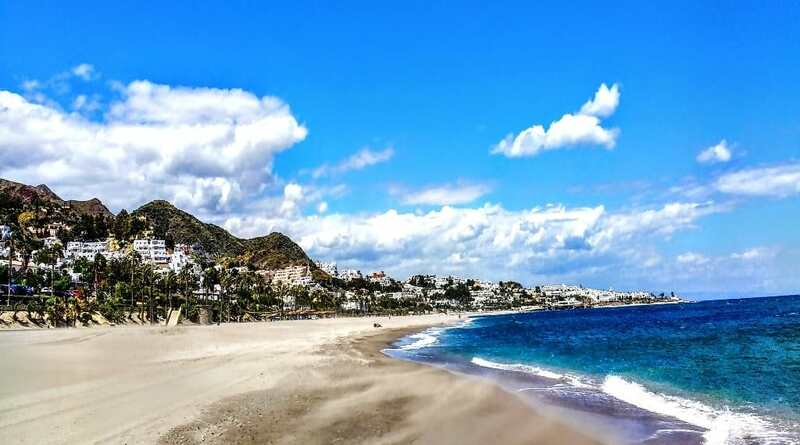 There are over 17 beaches on this stretch of coastline including naturist beaches and 3 blue flag beaches and although they all have different names they run side by side up the Almeria coast of Mojacer. Here there is a “beach” for everyone. 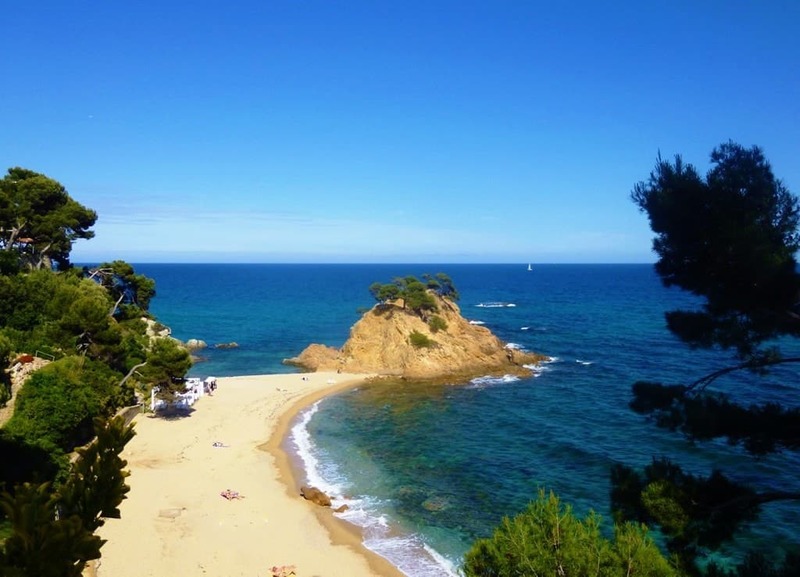 An hour and a half away from Barcelona lies a secluded beach on the Costa Brava, close to Platja d’Aro. Platja d’Aro is a resort town, and the stretch of flat white sand is beautiful but busy. A short walk from the main strip we found a secluded cove which was a gorgeous respite from the crowds. Cala Cap Roig is beautiful combination of rocky outcrops, white sandy beach and coastal paths to explore, I loved chilling out here and feeling the warm sunshine on my skin. There is a small café bar on the beach serving drinks and snacks, and if you’re feeling brave you can climb up the rocky Cap Roig for a bit of adventure! Formentera is the smallest of the Balearic Islands, near the Northeast coast of Spain. This small island is like a Caribbean dream island in the Mediterranean Sea with beautiful white sand beaches. Amongst the precious beaches on Formentera Island, the sandy Playa de Ses Illetes is the most popular one, the flagship beach of the island. It’s a long stretch of sandy beach on a small peninsula surrounded by large sand dunes. The turquoise-colored and crystal clean water makes you feel yourself in the Caribbean. As the beach is quite long, you will find a calm spot even in high season, you only have to walk for a while from the parking. In Formentera nudism is completely normal, and the beach is part of a national park, so the access is limited to vehicles. Zlatni Rat is a stunning beach with turquoise water located on the island of Brac, in Croatia. This is considered to be the most photographed beach in Croatia, and we can understand why. 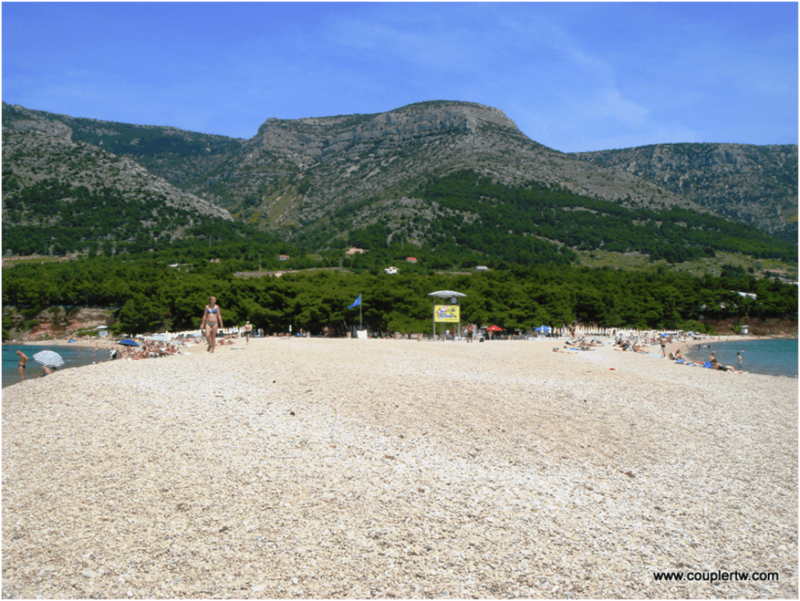 The beach has the form of a horn, thus the name Zlatni Rat, which translates to golden horn. The unique thing about it is that the shape and the size of the golden horn change according to the sea currents. We loved this beach, it wasn’t overcrowded when we visited it, so we could relax, enjoy the sun, and swim in the sea. The only downside of the beach is it doesn’t really have sand. Although It looks like a white paradisiac sandy beach, in really those are small white rocks. Croatia is a beautiful country with stunning beaches and Zlatni Rat is the cherry on top! 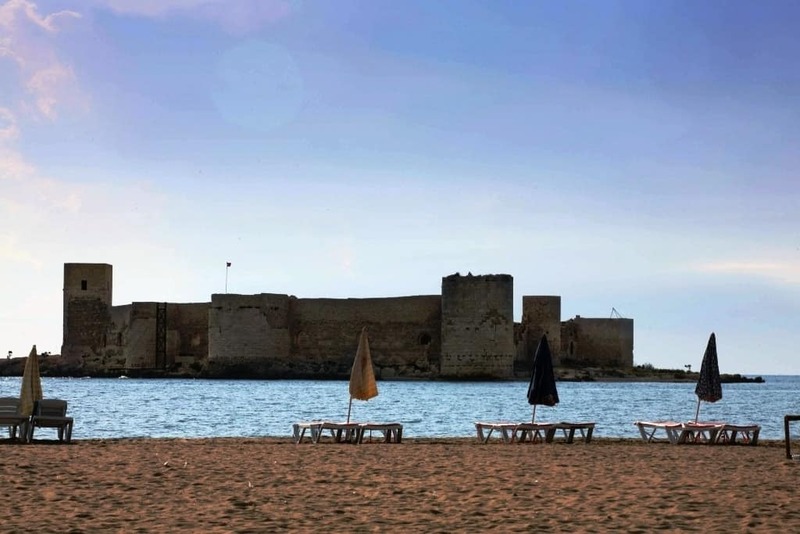 While Spiaggia Del Principe may be known as the Prince’s Beach (because it was Prince Karim Aga Khan’s favorite beach), it’s truly a beach fit for a queen. 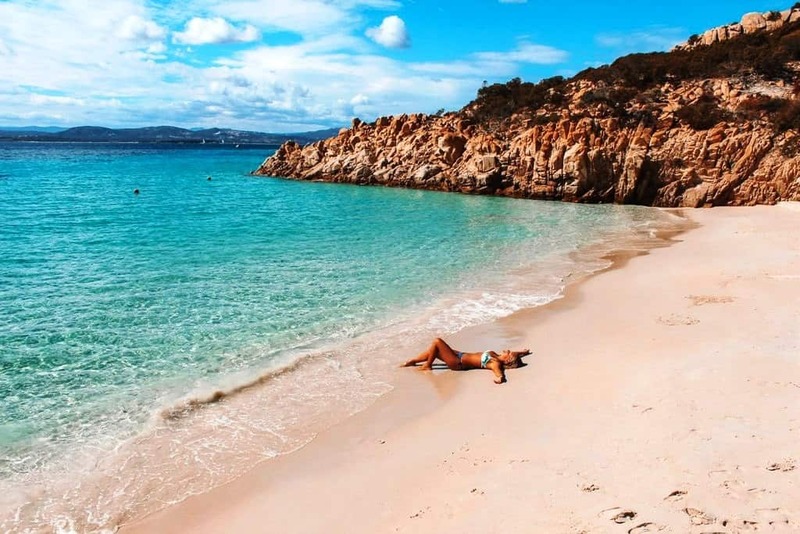 Located on the Costa Smeralda, or Emerald Coast of Sardinia, this pristine beach boasts crystal clear Caribbean colored water and unspoiled white sand beaches, making it one of the top beaches in all of the Mediterranean. The jagged rocks that envelop the outer edges of the beach create a dramatic horseshoe shape to this impeccable beach. 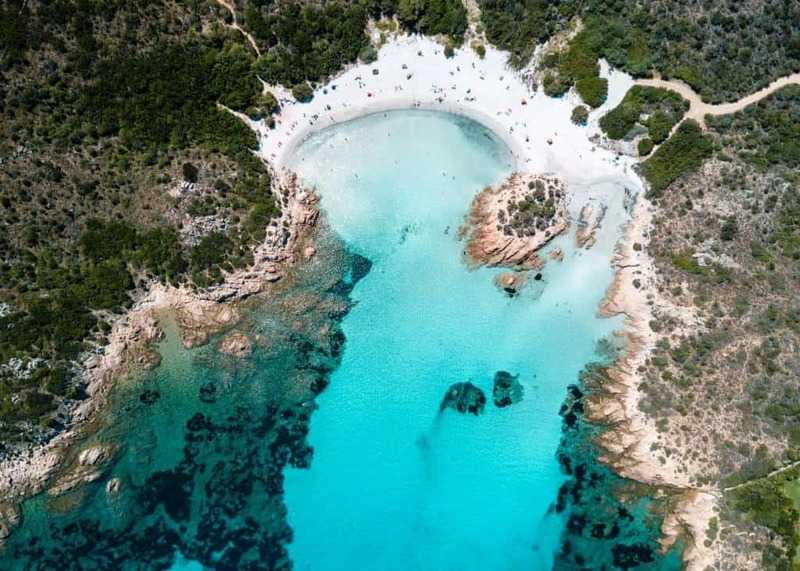 Sardinia is known for its incredible beaches, but the natural beauty of Spiaggia Del Principe makes it stand out as the best beach in the Mediterranean amongst steep competition. 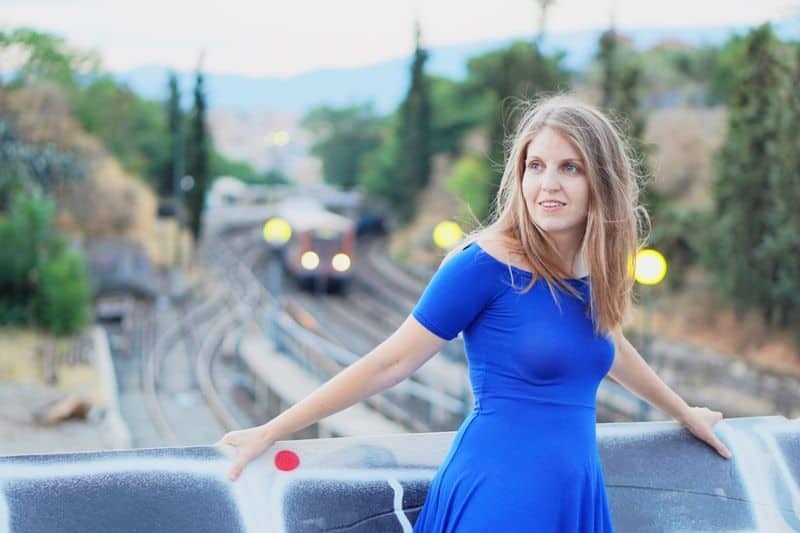 One of our favorite places to go every year, Kizkalesi on the southern coast of Turkey, is the most relaxing and beautiful beach we’ve ever been to. Our lounge chairs look out over the gorgeous blue of the Meditteranean Sea, but there’s more to see than just water. There are not one, but two castles so close you can almost touch them. 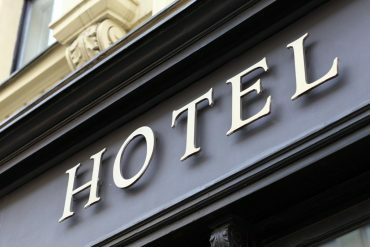 One is on the beach, and you can just walk over and explore it for a minimal cost, but the other is even more special. Off the coast, but only slightly, folks like to swim to the castle and back. We’ve done it a few times. The water is very salty and provides great buouancy, and the swim even with a few waves, is rather an easy one. Grab a fruity drink, some snacks and watch the sunset over the castle. You’ll never forget it. The unique setting of Sa Calobra beach in Mallorca at the end of the Torrent de Parreis gorge is what makes this my favourite beach in the Mediterranean. Reached by a single terrifyingly twisty road down through the steep Serra de Tramuntana Mountains, you’d be forgiven for wondering what all the fuss was about when you reach the tiny port of Sa Calobra, but head along the path to the east into a short tunnel through the cliffs and when you emerge on the other side, the reward is apparent. A huge amphitheatre of part pebble, part sand beach surrounded by dramatically steep-sided, jagged peaks opens up in front of you with a narrow inlet gouged through the cliffs to the sea. It’s a little piece of heaven but is very remote with no facilities so make sure you bring everything you need with you! Click here for more things to do in Majorca. I have traveled to many destinations in the world, and still to this day, Stefanou Beach in Crete remains one of my favorites. In my opinion, Chania is the most beautiful part of Crete, all the beaches around make it an ideal spot for sunbathing. I found solitude and surreal beauty at Stefanou Beach. The beach is fairly unheard of among the tourist crowd, and I have to believe that is because of the heart-stopping zig-zag drive down to the beach. There is only one way to access Stefanou Beach, and yes, it involves a straight down and narrow drive. Once you get to the parking area you still have to make another 15-minute hike down to the actual beach. However once you arrive you’ll discover that all your hard work was well worth it. Stefanou beach is absolutely incredible. Here is where you will be surrounded by bright blue and turquoise water, white sand, and plenty of places to cliff jump! Just look at the photo! 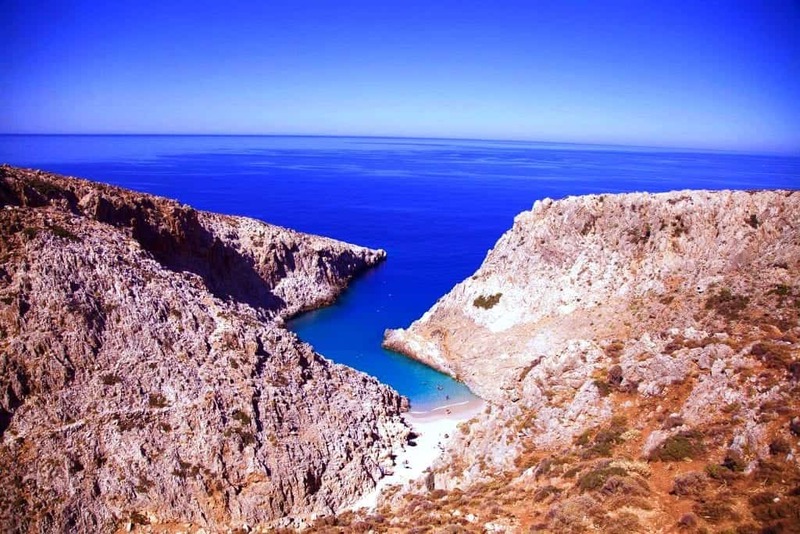 Click here for more beautiful beaches in Crete. The magnificent island of Sifnos in the Cyclades Group has many fabulous beaches to wile away a lazy summer day. Most are calm and protected and therefore its a popular island with families and singles alike. 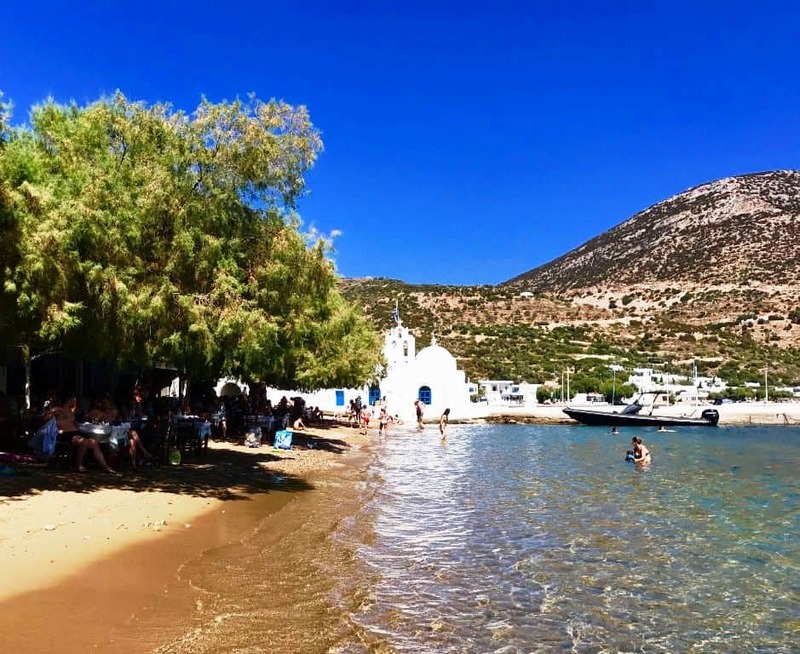 On our last trip to Greece we spent 5 days exploring Sifnos and Vathy (or Vathi) located on the South West coast, was our favourite spot. Situated on a wide bay surrounded by tall cliffs which protect it from the wind it also offers a small safe marina for yachts to moor. Whilst small and relatively quiet Vathy is well set up for tourists with a number of small local hotels and apartments and a group of excellent seafront taverns where there are a number of sea loving trees which offer plenty of shade whilst you eat, drink or swim. 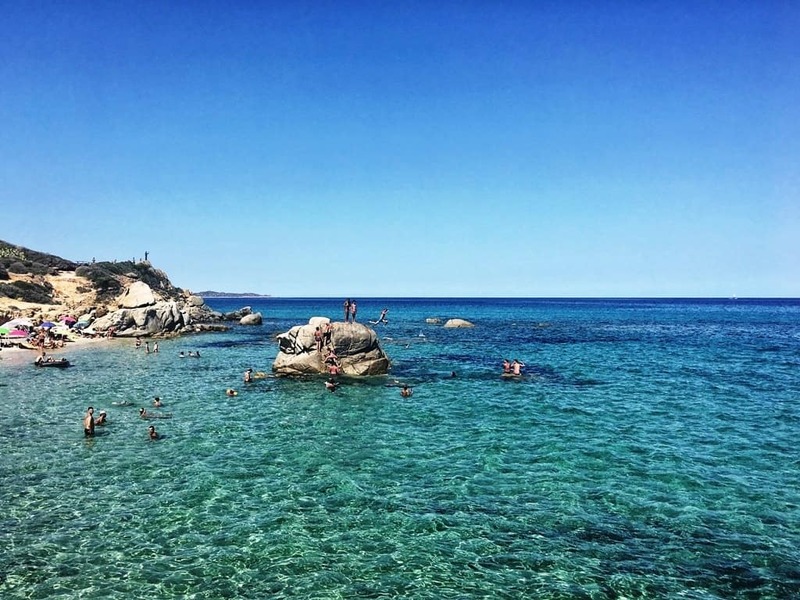 Hands down, our favorite beach we have experienced in the Mediterranean is Poliegos. It’s a beach with the most vivid blue color we have ever seen! You can find the beach on an uninhibited island just off of Milos Island in Greece. 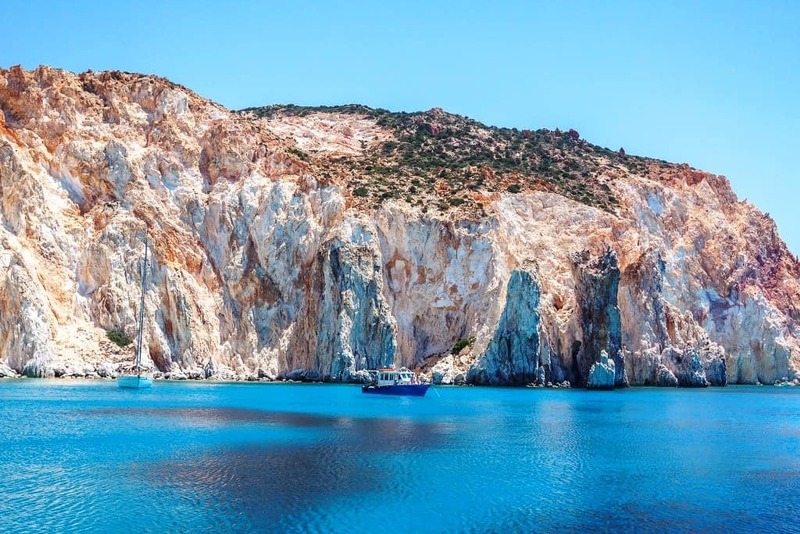 There are several boat tours that operate off of Milos Island that include a stop at Poliegos. As the boat sails among rock formations, this gorgeous beach comes into view against amazing cliffs and sea caves. Jump right off your boat into the vivid waters and go explore the surrounding rock formations. The shockingly bright color of the water will make this an experience you will not soon forget! 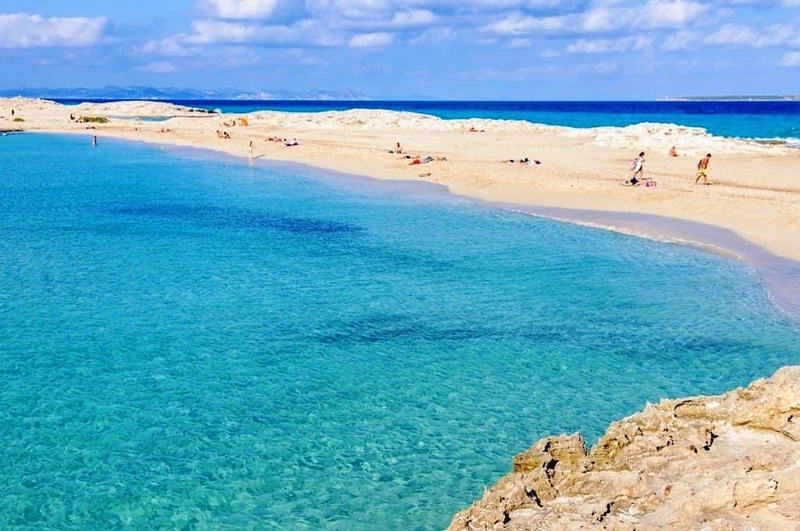 CalaSaona is situated on the western coast of the Balearic island of Formentera. Sheltered by the surrounding cliffs, this picture perfect little bay boasts a sandy beach and turquoise waters. A couple of beach bars and one nearby hotel make it just developed enough for a relaxing day out with a coffee or cocktail in hand. Whilst it can get pretty busy during summer, especially for sunset, you can have the place almost to yourself when going off-season. If sharing the beach with crowds isn’t your thing (even if the crowds are much smaller than on neighbouring Ibiza), consider renting a sailboat and taking to the seas, one of the best ways to discover Formentera! Praia Dona Ana is one of the most spectacular beaches in the Algarve, in Portugal, and for that matter Europe or anywhere. 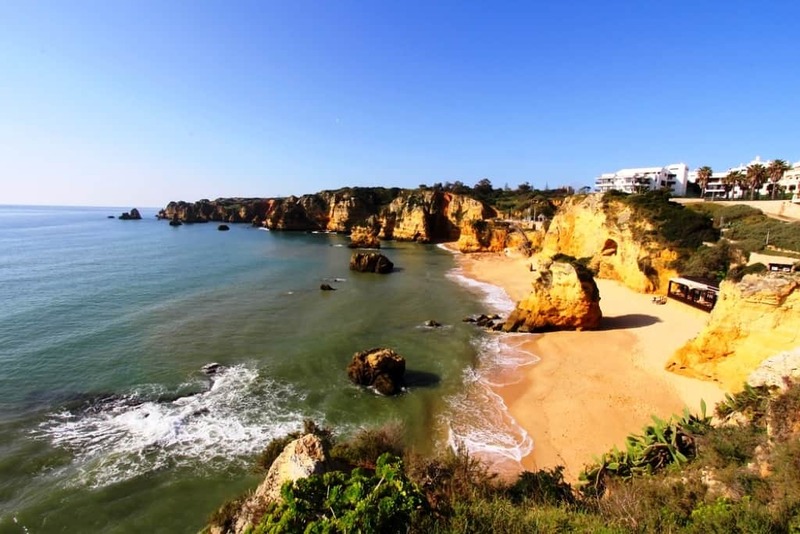 It’s tucked away on a peninsula just to the south of the bustling Algarve resort of Lagos, off the road down to the spectacular Ponta da Piedade (Point of Piety) headland. The Algarve is known for its stunning beaches, but for us Dona Ana has long been one of the very best. The beach itself is an arc of gorgeous golden sand, washed by the crystal-clear waters of the Atlantic, but it’s the setting that makes it stand out. Dona Ana is surrounded by amazing rock formations, fairytale gingerbread chimneys, towers and turrets and ochre cliffs making this corner of Portugal unforgettable. 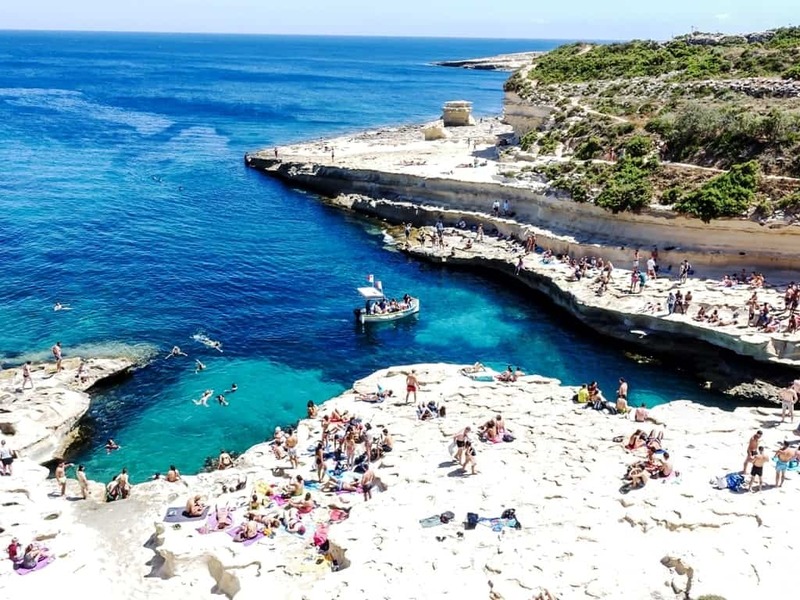 There’s also a wonderful cafe to sit and while away the hours surveying the scene, and at the foot of the cliffs on the Ponta boat trips take you into the sea arches, grottoes and rock formations to explore further. 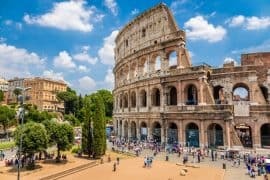 Undoubtedly one of the unique and stunning sites in the Mediterranean. 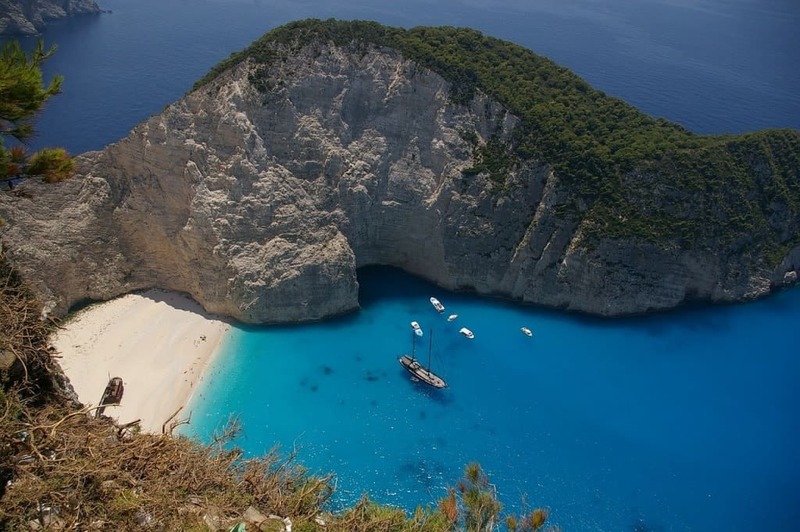 Navagio, also known as Smugglers Cove or Shipwreck beach is in the northwest part of the island of Zakynthos, in Greece. You can reach it directly by boat from various resorts, or take a bus to its near vicinity and then get a boat ride to the beach. You cannot walk to the beach since it is surrounded by high cliffs and inaccessible terrain. Make sure to put on your swimming suit because you’ll be needing it, and definitely bring an umbrella or a hat to avoid heat stroke as there’s not much shade around! 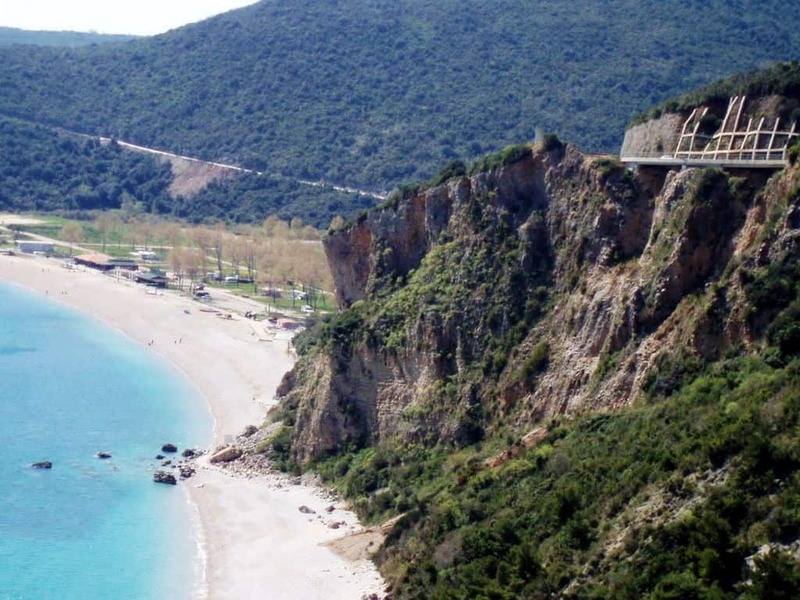 Click here for more beaches in Zante. I prefer the ones that are more difficult to get to as well as they are more beautiful, and less crowded.